UPDATE: This process works for macOS High Sierra Mail App (v11.x). It also works in prior versions down to v3.x. 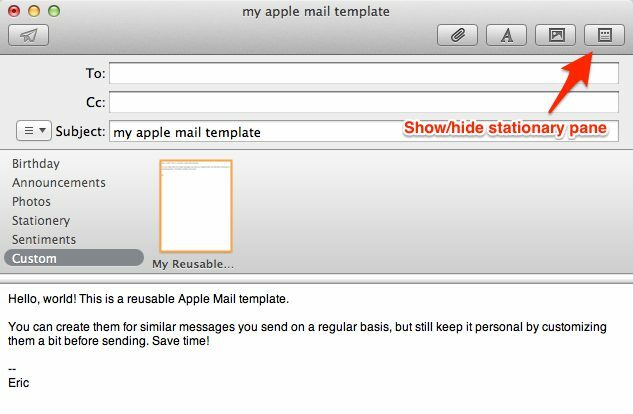 Apple has removed the Stationery feature from Apple Mail in macOS Mojave, so I have come up with an even easier way to create email templates in Apple Mail. This works great. However, my mom is 92, and following the steps to get to the custom stationary is just too much. Is there a way to create a shortcut that she could click on from the desktop–one that would open the already-created stationary so that it is ready to send? This helped me today. Thank you. This is great, i just set up my templates after watching your video. However i compose new message. I select the custom template. But the template i created and the text does not display in my new email…..
… Hi Again Eric… I also tried using NONE signature. And i still cannot edit the template…. Such as add a name…. I recently found a new Plug-In that may be another option for those of us who use templates frequently or would like to. It’s called Mail Act-On (https://smallcubed.com/mao/). I haven’t tried its template function yet because one of the methods I learned in this comments thread has worked great for me, but I’ve started using it for its “Send Later” function and that is working great. It lets me write emails late at night but have them send automatically during business hours at a time I specify. I also love delaying all my work emails by 3 minutes — it’s amazing how often I think of one more thing to add or change after the email is sent! I was having the same problem of not being able to edit my stationery page I created. Everything turned blue. After removing the signature and adding the extra line of text at the top I’m able to edit and add my copy. However when I send the email my logo at the top of the page shifts from being centered to the left. Is there a way to keep the logo centered when my email gets sent? Your help is appreciated! I’m Glad you said Mac Mail, meaning OSX/Sierra …try to do the same using IOS! YIKES! …I would love to see your tutorial Eric, for ANY email client for ipad/iphone that would allow me to create templates. Sure I could create them on my Macbook Pro however that becomes counterproductive to create on one device to use on another. Besides, how would I transfer them to my other devices? Icloud? All I’m trying to do is simply create a transparent working environment so my production is not DEVICE DEPENDENT! Am I asking too much? I look forward to your earliest reply. Thank You. Guys I am a realtor and want to make a Template of the Office Letterhead that I want to save as a Template and use it as the default email template that i can use as a letterhead send email messages. OR at least able to create a watermark in my emails so that the its looks very professionaly sent. DON’T FORGET I ONLY USE APPLE MAIL. this is really useful, but i’m not able to make any ammendments- changing name – adding a couple of lines et.. when i click on the body of the text it highlights everything and deletes all if i try to make a change.. Is there a way round this? Andrew, I’ve never heard of that happening. I’d suggest creating the simplest template by only using text, just to remove any other complications and see if you can get that to work. If not, I’m not really sure what the problem would be. This works for me and many others consistently. Any way to do a template that has attachments? I used to just forward an email that had the attachments with it but the content would come out completely wonky – all over the page and in different fonts – apparently that is a problem with forwards that your template idea solves. But do I have to do the attachments each time I send an email? If you use this approach outlined in a comment above, you can easily include attachments — each time you choose Send Again, the attachments will automatically be attached. Here’s the approach someone else described that has saved my life! I compose a message, send it to myself and then save it in a folder (eg: Templates). Then it’s resendable using “send again” from the context menu. Thanks Eric, this was very helpful once I found out where the Custom list was after clicking the Stationary button! Wow! You just saved my life. I had to use the NONE for signature and that worked like a charm. Question: can you use Excel to create personalized versions of the same email, as you can with Outlook? That would be a HUGE bonus for me. Thanks so much for an EXCELLENT tutorial. Thanks, Cay! Glad it helped! Re unable to edit; Made a template in mac mail with signature , couldn’t edit it to send custom , so I created an extra line of text at the top on the template, opened a new mail doc from the template, double click the extra line of txt and delete the line, then the doc is editable. I agree this is a pain and I have yet to find a way to stop all text being selected when you try and edit it. I have however figured out why it works like this. The assumption underlying the stationary is that is that it provides a fancy html *background* and the text is simply a place holder which is cleared as soon as you try and change it. I.e. it really is not a template system. The work around as you have discovered is to add some text at the top that you can select and replace which has the effect of deselecting the rest. Thank you, Reuby Tuesday!!! I’ve been using Mail’s stationery for a couple years now and I despise it. It’s so limited compared with other email apps I’ve used, like Eudora. No way to include attachments, no way to organize one’s stationery, just generally really clunky to work with. The send-again idea is brilliant and a much smoother way to achieve the same goal. THANK YOU!!! After creating a custom stationery, how can I share the stationery files with a colleague who needs to use them as well? I’ve tried zipping the files and just emailing them to my colleague, but after he downloads the files he receives no prompt to install the files or place them in the right location, so his mail client does not know where to find the template so he can use it. As you can see, it’s buried! But, thats where you’ll find the files. Try copying them in there. I haven’t tested this, but don’t see any reason why it wouldn’t work. Let me know how it goes. 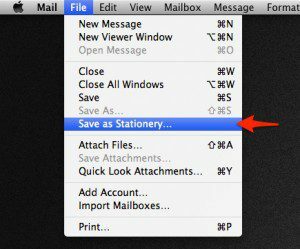 Since I’m still (happily) using an older OS (Tiger 10.4.11), the Save as Stationery option isn’t available. The combination of Reuby Tuesday’s suggestion and James Lex’s keyboard shortcut works perfectly for me! Thanks. I discovered this today and thought it would be a good solution as I need to send 60 emails with just slightly adjusted text in each. However, I also need to include a pdf attachment to the email. I get the error, “Can not send. Mail with stationery may not include attachments other than photos.” Arg. This should NOT be so difficult. Is there another way to make a mail template?! Unfortunately, this method doesn’t work with non0image attachments. I am looking for a way to create a template with basic text response plus two .pdf’s attachments. Perhaps the ‘Draft solution” mentioned by Rueby Tuesday in the comments will work. I had to go the “Send Again” route. I like this better, anyway, because then I can use it with my iPhone, too, and not just my Mac… but after trying unsuccessfully on 4 separate occasions to get the Stationary trick to work, I’m certainly glad I ready that comment… That’s way easier, and it works well. Hi, I’m looking for the same thing Darius explained. I want to be able to reuse a draft or template with two pdf attachments and also I have the same problem described above. When I try to use the template I can see in the icon that all the text is there but then I select it and only the signature appears. Even if I choose not to use the signature or if I create a new template without the signature, the same happens. Anybody has found a solution to that? Thanks in advance. It would be a life changer for me if I can figure this out because I need to send the same message (with only a couple of changes) to hundreds of recipients every week. Having a problem trying to implement this: I created a template by following your steps, but when I try to load it, the only thing that is visible is the signature part of the email. None of the text or message above that is appearing. The signature is definitely part of the template (and not an auto signature) because when I hover over it, that entire area of the email turns blue. Also, since that entire area is blue, it can’t be modified. Therefore, I can’t edit the message and replace a name or something. Any ideas what’s going on? Thanks! Furthermore, when I’m viewing the stationary to choose it, the thumbnail of my custom stationary shows the message, but once I click the thumbnail to choose/apply it, the message isn’t there…just the signature portion. I also can’t figure out a way to modify it. Is that even possible, or do I have to create a new one? Nevermind…I figured it out. Just closed Mail and reopened it and the custom stationary worked perfectly! Thanks for the great tip! I have this exact problem, too. Closing and reopening Mail doesn’t solve the problem as it did for jrlaughlin3. Any other insight? Hey Mike, I believe the issue you’re having is caused by a conflict with the signature. Try setting the Signature drop down to ‘None’ and then try selecting your template again. I was able to recreate the issue described and get around it this way. I have tried both approaches i.e. closing and re-opening, and choosing no signature when selecting the custom stationery as well as when making it. None of these options are helping. Any other ideas? I can see the template in its correct form in the thumbnail but then nothing appears in the body of the email when I click on it. ANY suggestions would be GREATLY appreciated! Hey Leslie, do you have any Mail.app plugins installed? Sometimes those may cause conflicts. Other than what’s recommended above I’m not sure what else could be causing issues in your configuration. Worked for me. Thanks. The signature block was overwriting the text in the stationary. I compose a message, send it to myself and then save it in a folder (eg: Templates). Then it’s resendable using “send again” from the context menu. 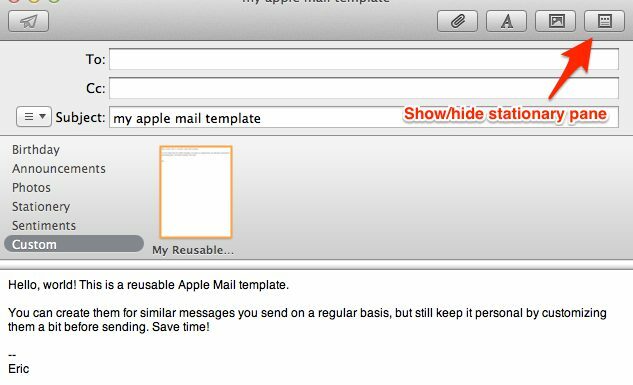 This way I can use the template from my phone and iPad rather than being limited to the mac mail client. This works GREAT. Using this concept with an Exchange or IMAP account is perfect because it works inside or outside of the Apple ecosystem. Tip: If you only use Apple Mail, there’s already a keyboard shortcut assigned to Send Again (Cmd + Shift + D) once you’ve selected the message. This is great advice. I will do this. Yay for pointing out the obvious that I didn’t catch on my own. I think this will work for me. The great thing is you can edit the template as well. Thanks for the tip. Thanks Eric- this is a big time saver for me! I know how to use templates in Apple’s Mail program but would like to make my own template backgrounds with text boxes similar to the Apple Templates. If I import a JPEG background, it only becomes a picture on which I cannot type. Is there a method to create one’s own background upon which text can be typed??? Find the .mailstationery file you want to edit, right click and select “Show package contents”. From there you can edit the template just like editing HTML, CSS and images to build a website. You can just save your design as a jpg (or take a screenshot of it), then drag/drop it into your mail template. In Finder, go to Go > “Go to Folder…”. You can navigate to that location from there. Where do I look for this: /Library/Application Support/Apple/Mail/Stationery/Apple/Contents/Resources/ ?? I’m sorry to be a novice, but I don’t know where to look for this. Thanks, Josh! Simple solution that people don’t always think about. Looking forward to implementing this.